Anessa is a very enthusiastic and friendly person who was very eager to get a job and become more independent. She was attending Post High when she was referred by her Vocational Rehab counselor, Theresa, to work with an employment specialist. She started working with Megan to seek a job that had low public contact. Anessa has been diagnosed with mild autism and struggles with some anxiety in public settings. Anessa's mother suggested that Anessa may enjoy working in an assisted living facility. Megan her employment specialist was able to work with Anessa to achieve that goal. Anessa was hired at Heritage Home Assisted Living in Hurricane, Utah on January 12th, 2017 to help during meal time with primarily washing dishes. When her manager saw how well Anessa worked, it was suggested that she acquire a food handler’s permit to be able to be cross trained to help with serving the patients in the home. 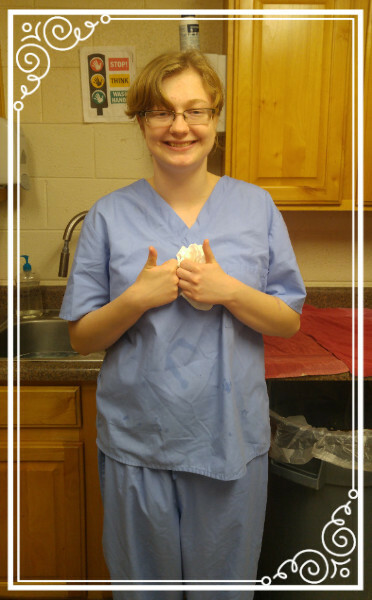 Megan was able to assist Anessa with acquiring her food handler's permit along with helping her learn the tasks she would perform and appropriately interact with the patients and co-workers. Anessa loves her job and the people she works with and the owner and managers are very happy with her being a part of their team. A special thank you to Theresa her VR Counselor and Megan her Employment Specialist in St George for their continued support of Anessa.